John Galliano makes his thoughtful return to the runway at the helm of the house of Margiela. The designer talks to Hamish Bowles about his inspirations, his newfound sobriety—and happiness. The following day, as we wait expectantly for the first girl to appear, the atmosphere is no longer playful but reverent. Hans Zimmer’s serene “Flying Drone” plays, and the guests are collectively “holding their breath for the first day of the rest of Mr. Galliano’s fashion life,” as The New York Times put it. Galliano had been looking for “a very sparse, modern, white space—instead of doing it like divine decadence,” and the spaceship show venue, in a newly built office close to Buckingham Palace, suggests a radical palate-cleanse after decades of high-voltage spectacle. A hundred and fifty whitewashed ballroom chairs are democratically ranged in single files flanking the long runway, which is set in a pale tunnel with square aluminum floor tiles underfoot. A fashion audience is a notoriously tardy one, but at the appointed hour, all but two seats are filled. Ten minutes later, however, just as the lights dim, Mr. and Mrs. Jamie Hince appear. A giggling Kate Moss—wearing a battered black biker’s jacket over a vintage black satin Galliano slip—mouths, “John’s gonna kill me . . . we got caught in school-run mum traffic!” Zimmer’s soothing music segues into the startling trumpet blast of “Big Spender” (“So naughty, isn’t it? So rude! A little bit of humor,” Galliano explains), and the show begins. The collection is autobiography too, really, from the Incroyables coats, inspired by the extravagantly dressed dandies of Revolutionary-era France that Galliano first showcased in his 1984 St. Martin’s graduation collection; to the bias-cut tailoring he presented a decade later in a memorable show at socialite São Schlumberger’s ravishing, deserted Parisian town house; to a version of a deconstructed 1954 Dior skirt; all merged with Margiela-isms as seamlessly as a bold scarlet coat that deftly fades from wool to chiffon. Galliano’s spin on the iconic Margiela Stockman jacket—a tailor’s dress form—opens the show. In this iteration the bodice may look battered and stained, parts of its stuffing spilling out, but these effects are mimicked in sophisticated and painstaking embroidery techniques. The tautly edited 24-piece collection is whimsical, thoughtful, and inventive, and blends Galliano’s soaring, hectic imagination with Margiela’s own powerful legacy. The headquarters of the fashion house that the maverick Belgian designer Martin Margiela founded in 1988 has been based lately in a rambling Gothic structure in Paris’s coolly edgy Eleventh Arrondissement. Built as a convent in the eighteenth century, it was repurposed in the 1920s as a boys’ industrial-design school. In the spirit of Margiela himself, who saw beauty in patina, it has been left seemingly as it was found, save for a coating of the designer’s signature whitewash. These white surfaces have in turn been scuffed, so that they tell their own mysterious stories, revealed in the unforgiving light of naked bulbs and fluorescent strip lights. I visited John Galliano’s airy studio in early December, as he was putting the collection together. Here, in a room on the second floor, the building’s harsh lights have been replaced with the soothing flickering of candles. Galliano, of course, sees beauty in patina, too, but of the romantic Miss Havisham school. From his electrifying St. Martin’s collection to his career at his own house and then for Givenchy and Dior as well, he blazed through three decades of unrelenting creativity. Since his world imploded, the designer has struggled with his demons and reached out to the Jewish community, receiving support and, ultimately, praise from no less an authority than the Anti-Defamation League’s Abraham H. Foxman. In 2013, Oscar de la Renta invited Galliano into his studio to collaborate on a collection, and in October 2014, he moved to his new offices at Margiela. After his time spent juggling the overwhelming complexities and demands of a billion-dollar luxury brand, Galliano is more hands-on than he has been in years, “which is why we got into it in the first place, isn’t it?” he asks rhetorically. He walks me through the house as Gypsy, his tiny Brussels griffon, scurries about underfoot, and introduces me to his new co-workers—many of whom are long-term collaborators. These include his studio director, the svelte blonde beauty Vanessa Bellanger, who tracks the subtle changes from sketch through fittings of each piece in elaborate albums of drawings and photographs. Several have been recolored to show Galliano the possibilities. “They’ve just done it on a computer,” he whispers, faintly incredulous. “I’m living with the times!” Bellanger is tasked on this collection with finding the perfect red (“that I’ve used as shafts of light” in a sea of black) and then matching it across the fabric choices. The atelier, where Galliano has assembled a skilled new team, is a flurry of activity, with elaborate toiles of classic men’s trousers that have morphed into skirts, and an overcoat pulled inside out so that the lining becomes the dress and the coat its train (this will metamorphose into Galliano’s bride). Galliano’s studio is infused with the atmosphere of his apartment in an eighteenth-century town house in the Marais, where he lives with his partner of fifteen years, the stylist Alexis Roche. Both interiors are as densely decorated as his inspiration boards, the walls hung salon-style with contemporary photography and historic artworks, and surfaces crowded with books, objects, and poetically eccentric flower arrangements—pale-orange carnations with soft mauve-pink dahlias and palm fronds, for example. There are treasures found at the antiques shops in Auvergne in the remote heart of the French countryside, where the couple has a stone farmhouse (largely abandoned during the frenzied Dior years, it has latterly proved a soulful refuge), as well as Galliano’s beloved puces. He is keen, however, to assert that “recycling doesn’t have to be flea-bitten old dresses. It can be something that’s as gorgeous as a seashell.” There is indeed “a veritable seafood platter” laid out here: Galliano trawled the beaches of Normandy for shells, tracked others down on a tiny island in the South Pacific, and even had the mother of one of his assistants save the mussel shells from her moules marinières, which she scrupulously scrubbed clean. These have now been assembled into extraordinary, surreal faces that evoke the vegetable visages painted by Giuseppe Arcimboldo in Renaissance Italy and will serve as fastenings. Galliano has modernized them with chrome, lacquer, and gleaming car-paint finishes. Meanwhile, he has been delving deep into the Margiela archive, focusing on the 20-year tenure of Margiela himself (who left in 2009 and is now devoting himself to art projects and living a domestic life nearby). Not long after Galliano’s appointment, Margiela met him for tea and stayed to talk for hours. Galliano was euphoric about the meeting, although deferentially protective of what transpired in the company of the famously incognito Margiela, who has never given an in-person interview to the press. (In 2001, Vogue sent Annie Leibovitz to photograph independent designers. The brilliantly conceptual Margiela portrait was an old-fashioned high school group of 45 mostly white-coated accomplices, with a single empty chair in the front row representing the designer himself.) Galliano will, however, volunteer that the meeting “was a godsend, so cool and so interesting,” and helped him understand “the codes of Margiela” and they discovered unexpected mutual interests. 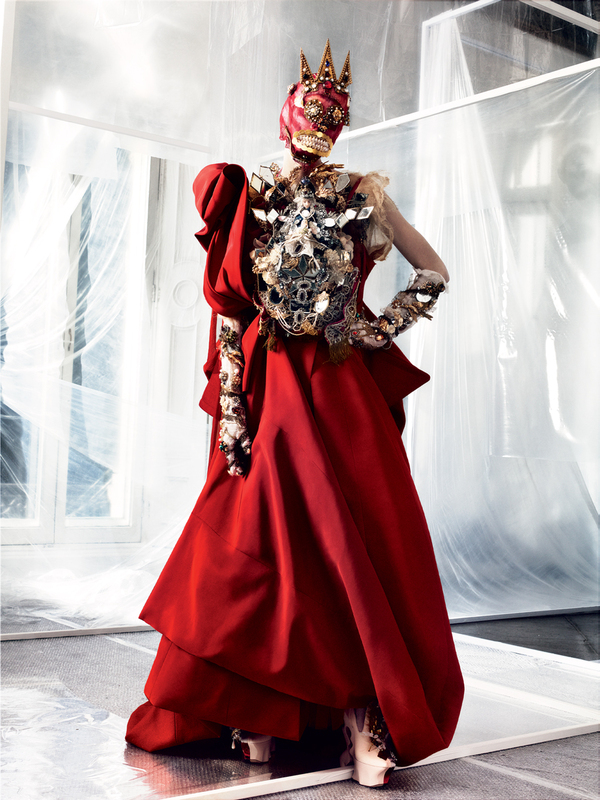 “Make it your own,” the founder of the house told Galliano of the newly renamed Maison Margiela. There is a playfulness at work here, too, with kirby grips used as elaborate fringing, and a trim that seems, from afar, like the shredding feather boa of a down-at-heel burlesque dancer, but on closer inspection proves to be lacquered toy soldiers fighting in hills of crinoline ribbon. In 2013, Galliano was invited to give a master class to senior BFA fashion students at Parsons, but the New School’s Jewish Student Union organized a petition that successfully blocked it. There were complications at Central Saint Martins (as it is now called), too, but here, four students independently went to the dean and insisted that they wanted to work with Galliano. And so it happened that the Italian Alessandro, Dutch Stefan, Japanese Watero, and English Oliver came to Paris, crashed on friends’ sofas (and in one instance a kitchen floor), and absorbed Galliano’s approach to design. He set them projects and took them to study historical treasures at the Musée de la Mode, and to the Paris puces hunting for treasures that could serve as inspiration points. It has been decided that the Icelandic performance artist Ragnar Kjartansson will depict Galliano for this story, so, rather surreally, a few days after the studio visit, Roche, Galliano, and I find ourselves in the airport car park in Reykjavík, struggling through fierce arctic winds to get to the cars and prize open their doors. Back at the show a month later, Galliano’s Margiela bride is making her entrance, her slouching scarlet splendor inspired by the “Velázquez” gesture of Roche slipping his arms through the interior straps of his Moncler jacket, and the bride’s face is wrapped in chiffon embellished like the bejeweled saints in Italian catacombs. For his twentieth-anniversary show in 2008, Margiela sent out his models for their finale dressed in his employees’ signature white coats, and so, in an echoing homage, Galliano sends his girls out a second time in the toiles for the outfits they have each worn. “Like someone’s trying to capture the creative process through toiles and drawings and my Post-It messages to the tailor,” explains Galliano, “disclosing some things at the end”—a revelatory look at the thought process and technical skills of a great designer, who is putting himself together at the ultimate house of deconstruction.